Known as the “Father of Fleet Street”, Wynkyn de Worde was key figure in the early use of the printing press in England. 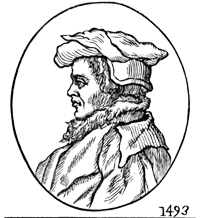 Born on the continent (candidates include Wœrth in Alsace in north-east France and Wœrden in The Netherlands), Wynkyn – whose name comes in various spellings, although it is said to have originally been Jan van Wynkyn – is believed to have become apprenticed to a printer in Cologne before meeting with famed pioneering English printer William Caxton in the early 1470s. 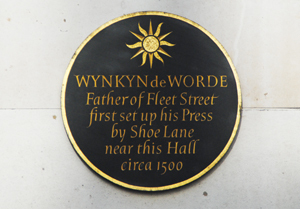 After Caxton’s death in 1492, Wynkyn took over his printing business and, around 1500, he relocated his office from Caxton’s Westminster premises to the “sign of the Sun” in Fleet Street near Shoe Lane – in fact, he is credited as being the first printer to locate in the street which becomes famously associated with publishing. There’s a plaque (pictured below), on the wall of the hall of the Worshipful Company of Stationers, located off Ave Maria Lane near St Paul’s Cathedral, commemorating the move (although Shoe Lane is located some distance away). Wynkyn later also ran a shop in St Paul’s Churchyard. While Wynkyn, like Caxton before him, relied on the patronage of the rich and famous (Margaret Beaufort, mother of King Henry VII among them), he also printed relatively inexpensive books in a bid to capture a wider market. In all he published more than 400 different books in at least 750 editions ranging from religious texts and poetry to fictional romantic works, educational textbooks and books aimed at children. He is noted for his use of woodcuts illustrations while his other claims to fame include being the first English printer to use italic type and the first to print music from moveable type. De Worde died around 1534 but his legacy lives on through the mass media publishing of today (albeit not longer from Fleet Street). There is a Wynkyn de Worde Society based in Suffolk which is aimed at furthering the printing industry.